Jerome Powell, the new chairman of the Federal Reserve, makes his first appearance on Capitol Hill on Tuesday. Every Fed chair goes before Congress twice a year to report on the state of the economy. Investors will be paying even closer attention this time for clues on how quickly the Fed might raise interest rates if inflation picks up. Lawmakers will get their first glimpse of Powell's plans for the Fed when his prepared testimony is released at 8:30 a.m. ET. Powell is scheduled to answer questions from the House Financial Services Committee later Tuesday, then the Senate Banking Committee on Thursday. Here are four things to watch for. Will the Fed raise interest rates faster? All signs point to Fed rate hikes in 2018. The question is how many and how far. Fed officials are increasingly optimistic about U.S. economic growth. They have already penciled in three rate hikes this year, and two more in 2019. Many economists now expect the central bank to raise rates four times this year, because the Republican tax cuts may quicken economic growth and speed up inflation. "There is a real possibility that some of the factors that have been holding back growth in recent years could shift, moving the economy onto a higher growth trajectory," Fed Governor Randal Quarles said in prepared remarks Monday before the National Association for Business Economics. "It has been quite some time since the economic environment has looked as favorable as it does now," he said. The market already anticipates the first increase of the year will come in March, at Powell's first Federal Open Market Committee meeting. How will the tax cuts affect the economy? Fed officials have kept their expectations tepid. It's a contrasting view from the Trump administration, which has boasted about its long-term growth prospects. A number of Fed policy makers have upgraded their growth outlook for 2018, noting the impact of tax changes could be "somewhat larger in the near term than previously thought," according to minutes from the January 30-31 Fed meeting. Quarles, who gave a bullish speech on the U.S. economy, said there's "early hope that the business investment drought that has weighed down growth in recent years might finally be breaking." He noted that the tax cuts, enacted in December, would also probably give a boost. Still, Fed officials have yet to improve their longer-term forecasts for economic growth. James Bullard, president of the St. Louis Fed, said Monday that, with inflation so low, central bankers have room to revise those expectations if businesses invest a lot more over the next two years. "I don't think I have to get out in front of this process," Bullard told journalists on the sidelines of the NABE's annual conference. "I think I can wait and see. Let's see if the investment boom happens. Let's see if productivity picks up. If it does, I'm perfectly happy to react to that data." Will inflation finally pick up? Inflation has been a bit of mystery for Fed officials. But it finally appears to be rising closer to 2%, the level the Fed considers healthy for the economy. 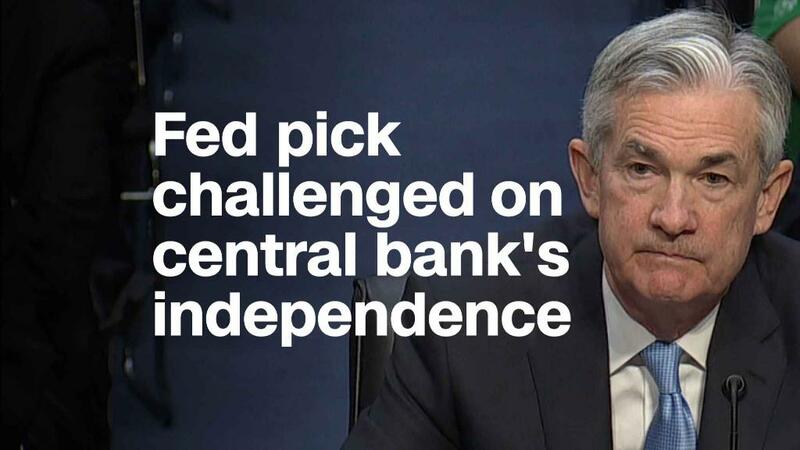 Lawmakers are likely to press Powell on whether he worries that the country's tight job market will push prices even higher, and force the Fed to raise rates faster. When the job market is tight, employers have to pay more to attract workers. To keep up, they charge more for their goods. The Fed believes the U.S. labor market is near or beyond full employment, according to its February 2018 Monetary Policy Report, released on Friday. In other words, because of natural churn in the economy, unemployment can't go much lower. More inflation data comes out this week: The Commerce Department will report on how the Fed's preferred inflation gauge performed last month ahead of Powell's second appearance before the Senate Banking Committee. Is Powell worried about the growing deficit? Congress has added to the deficit with two recent bills: a $1.5 trillion tax cut and a $300 billion spending bill. Lawmakers are likely to ask Powell over his concerns about the country's growing deficit and whether it may leave little room for policy makers to respond adequately in the event of a mild recession. Powell's predecessor, Janet Yellen, has said America's debt burden "should keep people awake." And the problem will likely worsen as more people tap Medicare, Medicaid and Social Security, outpacing tax revenue. "This is something I've been saying for a long time," Yellen said at her last press conference in December press conference on the potential fiscal impact of the tax proposals. "I am personally concerned about the U.S. debt situation. Taking what is already a significant problem and making it worse, it is a concern to me." Kevin Hassett, Trump's top economic advisor, on Monday repeated the administration's argument that tax cuts will produce enough economic growth to offset the debt problem. But he added, "in the end, the deficit is a policy challenge."